I also made tea or hot chocolate for the students and let them lounge. 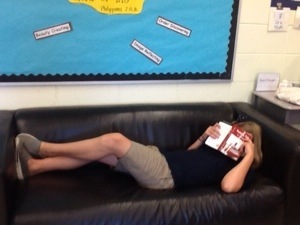 Some teachers may think I am soft but I wanted students to see how others enjoy reading. The best comments for me were the complaining words from the kids when it was time to put the books away. For summer reading ask for “high interest, low vocabulary” books or check out the ORCA books (there are different series like ORCA SPORT books, ORCA ECHOES for younger readers and RAPID READS). Also for summer, try audiobooks from iTunes or a website like audible.com or your ebooks from the library. Listening to books will build your child’s vocabulary, develop a love of story, and increase his understanding of stories. Make that iPod a learning tool!